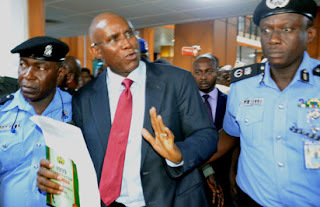 Suspended lawmaker, Senator Ovie Omo-Agege (APC-Delta), who was arrested at the National Assembly Complex by the Nigerian Police on Wednesday over his alleged involvement in the invasion of the Senate chamber and seize the mace by unidentified persons has denied being involvement in the snatching of mace . The Commissioner of Police, Federal Capital Territory (FCT), command, Mr Sadiq Bello, led the team of policemen, who arrested the senator and whisked him away in a Hilux van with registration number NPF 840 at about 1.50 p.m.
Ovie Omo-Agege in a statement which his office issued on his behalf on Wednesday evening said he returned to the senate following a legal advice, adding that he enjoyed the protection of some of his colleagues. “On Thursday, April 12, 2018, the senate purportedly suspended Senator Ovie Omo-Agege. However, based on legal advice and his understanding of the current position of the law, Senator Omo-Agege today resumed work and sitting with his colleagues,” read the statement signed by Lukcy Ajos who identified himself as a lawyer. “Following the said media reports on the Mace issue, the Police authorities decided to hear from Senator Omo-Agege. He has told the Police his perspective to help them carry out a proper investigation. He has since left the police. Senator Omo-Agege trusts them to thoroughly investigate this very serious matter.